The Meaning of "Account Closed by Creditor" on Credit Report? Your credit report includes a variety of information about your credit card accounts, including the status of each account. On closed accounts, your credit report may include a comment that indicates who closed the account and may say "account closed by creditor" if the credit card issuer closed your account. 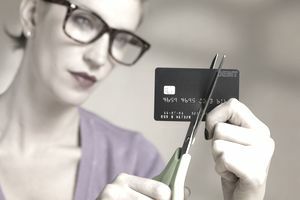 Creditors have different reasons for closing your credit card account. For example, your card issuer may close your account if you become too delinquent on your payments, allow the account to be inactive for a long period, or if the creditor is no longer issuing that card. Except in the case of delinquency, your credit report won't show the reason that the credit card issuer closed the account, only that it was closed by the creditor. Will "Account Closed by Creditor" Hurt Your Credit Score? The remark "account closed by creditor" or a comment that a creditor closed your account doesn’t hurt your credit score. This type of comment isn't picked up by the credit scoring calculation. However, the act of having a credit card closed, whether by you or the creditor, can hurt your credit score by raising your credit utilization. For example, your credit score could be impacted by a closed credit card if you have a balance on the credit card or if you have high balances on all your other credit cards and this was the only card with significant available credit. You can minimize the impact to your credit score by paying off the balance on the closed credit card, even if you have to pay it off over a period of time. If the credit card issuer closed your account because of late payment or serious delinquency, those delinquencies will impact your credit score. These late payments will remain on your credit report for seven years, but they will hurt your credit score less as time passes and as you add positive information to your credit report. Accounts closed in good standing will remain on your credit report for ten years or whatever timing the credit bureau has set for reporting positive, closed accounts. Even though the credit card account is closed, it will remain on your credit report. If you're still making payments on the balance, the payment history and timeliness of your payments will also be reported. It's important that you keep making at least the minimum payment on time each month, even after the account is closed, to protect your credit score. Late payments will hurt your credit score just as if the credit card was still open. If you have an account reported as closed and it's still open, contact your credit card issuer to find out why. If the accounts say the creditor closed it even though you were the one who closed it, you can use the credit report dispute process to have your credit report updated to show that. Remember, it doesn't hurt your credit score either way, whether you or your credit card issuer closed the account.